This requires details of your day of birth and the year for which you require the Personal Year Number. The 2017 numerology horoscope predicts that if your personal year number is 1, it indicates the commencement of new projects, new activities or special interests. What is important is to focus on your targets with your newly found mental and physical strength, and adapt to the changes to make life more successful and exciting. The numerology horoscope 2017 for personal year number 2 signifies persistence, collaboration and personal growth. You go by your instinct and feeling, rather than by logic. It will result in a harmonious state of affairs, and your mind will become stable and calm. Your relationships in the romantic and family spheres will see a change for the better. The 2017 numerology horoscope for personal year number 3 predicts a year of enthusiasm, creative growth and social enhancement. Socially this is a delightful year for the number 3 people. There will be abundance of joy and entertainment. While all this enjoyment and pleasure will be good for your personal happiness, if you are a business person you will find yourself in deep waters. The numerology horoscope 2017 for people with personal year number 4 shows this is a year of discipline, diligence and growth. You also need to be persistent. Only hard work will yield good results. While you are focusing on your growth and goals, do not ignore your health. 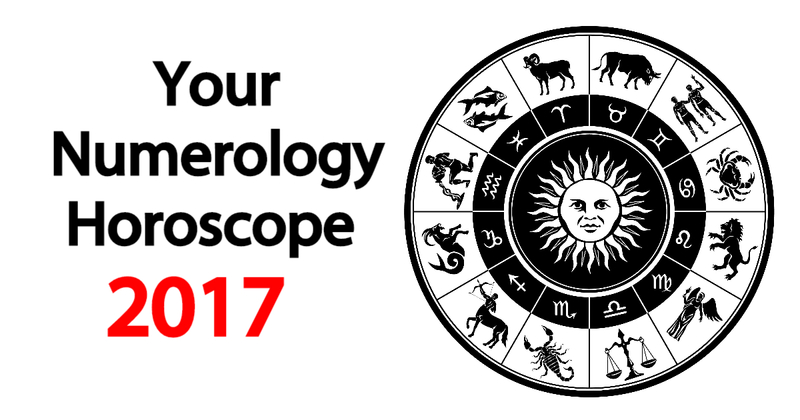 The numerology horoscope 2017 foretells that during this year all the restrictions of the previous year are removed. 2017 for number 5 people signifies major transformations and greater liberty. Another aspect of this year will be independence and personal freedom. You will give an expression to your hidden capabilities and will try to expand your mental outlook. The 2017 numerology horoscope for personal year number 6 is indicative of growing societal obligations and further commitments for family affairs. This will be a year of love and romance. You will be forced to meet the additional demands of being social on your career front. You might also be called upon to be helpful and solve the problems. The 2017 numerology horoscope for personal year number 7 predicts that in this year, you need to be ready for self-examination and future planning. Personal year 7 can be a year of improving your spiritual strength. You can look inwards and become aware of your understanding of life as a whole. The 2017 numerology horoscope for personal year number 8 predicts this is a year for achievements and rewards. You will be ambitious in your outlook and your mental strength combined with your professional capabilities will help in achieving your objectives. Possibilities of diversifying your business activities and spreading out are bright during the year. The 2017 numerology horoscope report for number 9 predicts that this is a year for taking stock and being charitable. Personal year 9 is a year for giving back to the society some of your wealth which you have gained from it. Love may be in the air for some of you during the year. The 2017 numerology horoscope for number 11 predicts psychic development and accomplishment. The numerology 2017 forecasts also warn that you have embarked on a new path different from your old monotonous routine and will face hardships in your journey. Personal Year 11 according to the numerology horoscope 2015 is a year of spiritual awareness and enlightenment. The numerology horoscope 2017 for number 22 signifies your commitment to the welfare of society. The year is more about making things happen rather than dreaming big, predict the 22 numerology 2017 predictions. You will be able to convert your big visions into reality because of your practical approach and diligence.